As with Google Chrome, the transition will happen on the web's largest sites first. Microsoft said Wednesday that it has chosen a strategy for its Edge browser similar to that of Google Chrome. Flash will be a click-to-play option in future builds, allowing users to turn it off entirely if they so wish. 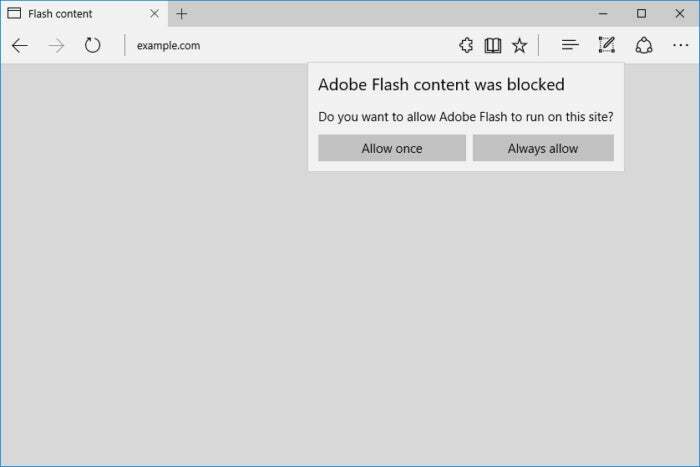 For now, the new Flash-blocking capability will be limited to members of its Windows Insider program running Edge (with EdgeHTML 15) within Windows 10. Eventually, those features will make it into the mainstream Edge browser used by the majority of users. According to Kyle Pflug, a communications manager for the Edge team, Insiders will be able to try it out in the next Insider build. Why this matters: Flash has long been considered a security risk as well as a battery hog, and more and more sites are simply moving to HTML5 content as a replacement. The days of Flash are over, and none too soon. Aside from some old legacy game and animation sites (hello, Newgrounds! ), there’s little reason to keep Flash around. Microsoft said that the Flash-to-HTML5 transition will happen gradually—not for the entire web at once, but on a site-by-site basis. Earlier this month, Google took the same approach with its Chrome browser, transitioning some of the web’s top sites from Flash to HTML5. It appears, though, that Google is managing some of those decisions itself, deciding whether to display Flash or HTML5 depending on how the user interacted with those sites in the past.